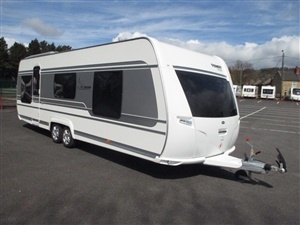 SPECIFICATION: 5 berth, twin axle, body length guide 25ft / 8ft wide. WEIGHT: MIRO 1831kg. MTPLM 2000kg. LAYOUT: front island double bed, mid washroom, dinette, end U seat area. FEATURES: double glazed, gas heater, blownair, mains electric, TRUMA 5ltr electric boiler, shower, cassette toilet, larder fridge/freezer, oven, hob, grill, microwave, flyscreens and blinds, door window/flyscreen, large rooflight, TV aerial, hitch stabilizer. THIS CARAVAN IS NOW RESERVED.